Where, Financial capital = savings, salary, inheritance and investments. Human capital = education, experience, skills, time and knowledge. Social capital = social relations and network. Human capital is the source of all the financial and social capital. Simply put, it is because of your education, experience, skills, time and knowledge that you are able to build connections and financial wealth. 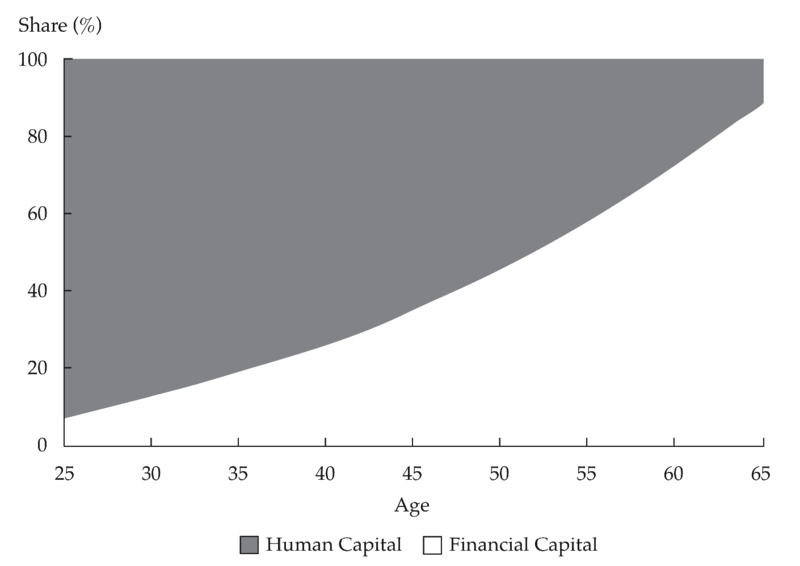 This figure illustrates the relationship between human capital, financial capital and total wealth over time. According to entrepreneur and researcher Roger Ibbotson, human capital is not only the source of almost all the financial capital that a person will accumulate over time but also the dominant form of capital. As you put your knowledge, skills, time and experience to use, the portion of financial capital increases until the money starts working for you to eventually become the majority of your capital. What most entrepreneurs don’t recognize is that when they invest time for fundraising, attend events and pitch investors, network and pitch co-founders, they are in fact investing their human capital. Consider this scenario where funding, co-founder and team are three asset classes like stocks, bonds and commodities. You have a certain amount of capital (human capital) that you want to invest in these three so you can obtain the end of result of say $50,000 in Angel funding, an experienced co-founder and two team members. Most entrepreneurs, especially first-time entrepreneurs, start with an initial investment of almost zero and yet, invest all of their human capital chasing the return before growing their initial position. The common outcome is a few months resource-hunting for an idea that has no proof. Most entrepreneurs are bad investors of their human capital. The truth is that business external resources like funding are almost always a consequence of startup value and founders’ background. Investing human capital to build these two key variables should thus precede or at least occur simultaneously. Bootstrapping is about building startup value with human capital and your internal financial capital (savings). While some people don’t have savings or prefer not to risk their money until later stages of the business, everyone has human capital. 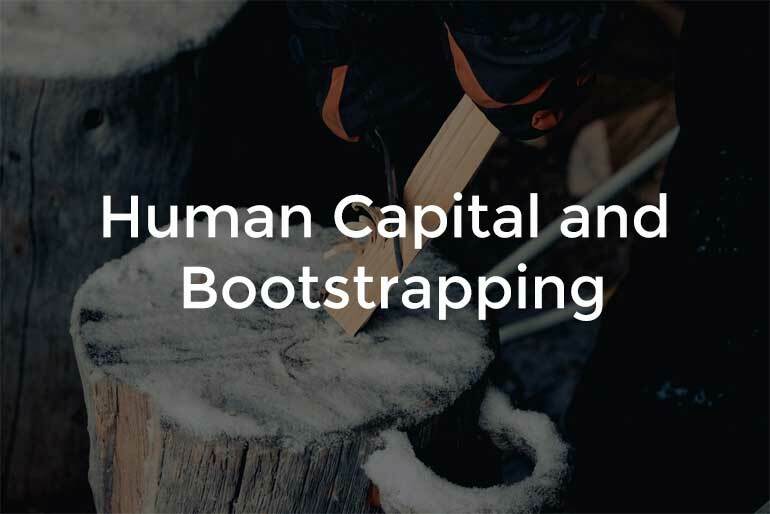 Bootstrapped founders who recognize the value of their human capital, not only find ways to build startup value with what they already own but also leverage their skills, knowledge and time to create financial capital for reinvestment and growth. Successful starting entrepreneurs focus more on the things they can control. In fact, in a research conducted on 1,050 entrepreneurs, Kim, Aldrich and Keister find that financial wealth is not near as strong as human capital when it comes to starting and growing successful startup ventures. Drawing on my own experience, some of the entrepreneurs I worked with invested over a hundred thousand dollars to start their ventures but failed to commit their human capital to make a business out of their ideas. Let’s first examine the two biggest components of our human capital. Knowledge: education, skills and experience fall under the knowledge category. The more knowledgeable we are, the more valuable our human capital becomes. This obviously explains why we get promoted and paid more, the longer we are in the industry. This also explains why investors pay more for repeat founders. In a study on 298 starting entrepreneurs, findings show that entrepreneurs with greater levels of human capital (academic and specific business training) are better bootstrappers. Time: The most critical component of human capital is time simply because if entrepreneurs don’t put in the time to execute on their acquired knowledge, business value won’t create itself. Knowledge has no value if not used to build value. Since knowledge significantly affects performance, educated entrepreneurs need less time to take their ideas or businesses from A to B as they make less mistakes and better decisions. Having started and used available resources to create value where the investor will serve as an enabler not a condition to start. Willingness to focus, adapt and learn quickly. Investors fund people, at least at the beginning stages of the company. This question implies that you have human capital. Everybody does. The difference from one person to the other is that some may have more time than knowledge and vice versa. The truth is, you only need a little bit of both. Fear of failure: Those are entrepreneurs that fail to start because they don’t know what to do so they’re afraid to fail. Knowing that an investment or a co-founder can protect their downside shifts their focus to acquire those two resources. Most aspiring entrepreneurs invest their human capital to protect the downside. Lack of time: Those are entrepreneurs that fail to start not necessarily because they don’t have time but mainly because of uncertainties. The simple logic is, why would I invest my human capital on a project or a venture that I am not sure is going to yield the expected return when I can do [task/project] instead and get [return] within [this period]? Most of the time, aspiring entrepreneurs that think like this are wantrepreneurs. The good news is that if the path to entrepreneurial success was linear, every rational person would have become an entrepreneur. It’s good news because entrepreneurship gives you the opportunity to be different and when you are unique enough, you have so much to be rewarded for. The only little work condition is to embrace uncertainty. The second good news is that there are many ways entrepreneurs can minimize uncertainty. Here are three simple steps for turning human capital into startup value under limited to no financial capital. Use what you already know. Ever since I built interest in entrepreneurship, for about a year, my main priority was to learn as much as possible. I read tens of books, took as many business classes as I was able to take, took a dozen online courses, and read hundreds of articles. When I started, I felt like I knew nothing. The business knowledge I acquired from 2 months running my first startup was more valuable than all the material I “learned” from books and courses. When you go to market, the business education approach changes. In this case, you will look for relevant answers instead of reading for the sake of learning. The acquired knowledge suddenly becomes useful and applicable. Use what you already have. Get your eyes off the screen for 10 seconds and think about what you already have (at least that’s how I think when I’m reading). Use the resources (mostly time and money) that you already have and willing to invest. You don’t need hundreds of hours or thousands of dollars. The more value you build, the more confident you will become and the more resources you will naturally want to commit. Use the help of a mentor. Answers to questions like: what’s the first step? what’s the next step? should you focus on this or that? how to solve this issue? should you make this investment? etc. can be found in two ways: 1) make the decision to the best of your knowledge, fail fast, learn quickly, assume the risk and move quickly, 2) ask someone who has been in your shoes, who can cut your losses, maximize your return and help you move a lot faster. 1. List the jobs that the needed resources will enable you to get done. With a business or marketing co-founder, I can focus on building the product. With a technical co-founder, I will be able to build the product. With funding, I can quit my job and focus 100% on my startup. With funding, I can hire a team and move a lot faster. With this piece of equipment, I can cut per unit cost by 50%. 2. Prioritize the jobs to be done from most to least important. 3. Find alternative resources/approaches to each job. When you list and prioritize jobs to be done and the resources required for each job, first, you’ll know what to focus on and second, your research, questions and brainstorming will be focused on finding alternative solutions to that specific job instead of saying, I need funding to hire a team or quit my job. In the examples above, you will go back to each job like building an MVP and think about different ways you could build this MVP without a co-founder, team or contractors. Some of your solutions could be using a platform like Bubble or simply simulating the MVP by sticking many publicly available tools together. Some jobs will need some funds. In this case, instead of asking, how can I find investors? you’ll ask, how can I generate funds that I can invest in my startup? This is the bootstrapping mindset and it is based on the idea that human capital is the source of all forms of capital. Maximize use of your human capital (skills, knowledge, hard work) to build value with the resources you own. Build greater value by reinvesting some of the resources created from step 1. Combine steps 1 and 2 to secure enough resources to delegate for growth and if needed get funded to grow faster. For this, you don’t need years of experience (or any experience), you don’t need a PhD (or any business degree), you don’t need countless hours, etc. All you need is to get to work and leverage what you already have even if it is just your passion for what you do. Control your own destiny. Let me tell you more here. 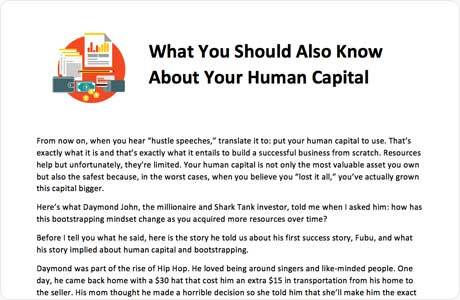 In the downloadable file, I share with you a story Daymond John told us recently about his first successful company, Fubu, and what his story implied about human capital and bootstrapping. Finally, his answer to my question: how has this bootstrapping mindset changed as you acquired more resources over time? Let me know your thoughts and questions with a comment below.